I know what you are thinking -- "Not another f-ing Mitford book!" Fine, we are a bit fond of the Mitfords, I cannot lie. I will chalk it up to being an only child. I am fascinated with large families. Bear in mind, I do not now nor have I ever wanted a large family or any sort of sibling. Growing up there were my things and more of my things and I liked that immensely. But there is something very mysterious about large families, especially one with 6 girls. No, the Mitford sisters were not sharing a single room, their family was loaded. But something about that sisterhood made for a strange and often tragic competition that boardered on psychopathy. Laura Thomson has put together a group biography of the sisters that offers and unusual in site into their personalities. It is rather like taking the them, fully formed and stuffing them into a single room. It offers up a much different view than seeing each sister from their own point of view. Lord knows, many of them spent their entire lives rewriting their personal history. 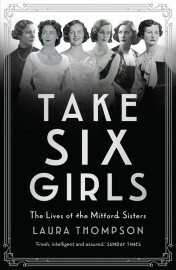 If you have yet to jump into the abyss of Mitfordom, Take Six Girls is a great place to start. You get an enticing view of each of the sisters, giving you room to decide which of the girls you might like to take a look at in more depth. Trust me, there will be great depth no matter which sister you choose. If you have read them all...even I don't think I have read them all...Thompson delves into the beginnings of family rivalry, to shed new light on the tumultuous gang. If you have never read about the Mitfords, Take Six Girls is a fine beginning. If you love the Mitfords, it won't be your last. I do, I absolutely love the Mitfords. I thought I had read just about everything ever published about them, but yippy! there's more! They're kind of like the Downton Abbey clan but with a dark and tangled but devastatingly interesting bend. Thanks- somehow, I missed this. As Liv said, the Mitfords are like Downton Abbey- I would add Downton Abbey on acid.